China’s Tian Pengfei first stepped up to the main tour for the 2006/7 and he was to make an immediate impact by reaching the last 32 stage before losing out to former world champion Shaun Murphy in a decider. Although he was not able to reach a second venue, victories against Dermot McGlinchey, Stuart Pettman and Jamie Cope took him to the final qualifying round of the Malta Cup where he was to lose out to Nigel Bond. With just two opening round defeats, his consistency was enough to see him retain his place on the tour for a second successive season. He was not to fare so strongly during 2007/8 however as despite another last 32 appearance, this time at the Welsh Open, a series of other defeats meant that he had not quite secured enough points on the one-year list to retain his place on the tour. Despite his relegation however, Tian was to feature prominently as a wildcard during subsequent seasons, defeating David Gray and Marco Fu during the 2009 China Open before seeing off Andrew Higginson in Shanghai later that year. His biggest win however was to come during the 2010 China Open where having defeated Mark Davis 5-4 in the wildcard round he then saw off world number one Ronnie O’Sullivan at the last 32 stage before losing to Mark King. Further victories came during the Wuxi Cup before he found himself whitewashed by countryman Ding Junhui in the semi-finals but he was able to go all the way at the BTV Cup soon after, defeating Welshman Ryan Day 9-3 to lift the title. 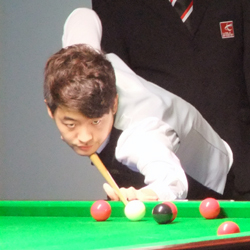 Having impressed many during the preceding seasons, few were surprised to see Tian Pengfei enter the 2011 Q School and it proved to be a wise decision as he defeated David McLellan, Robert James, Ben Judge, Sean O’Sullivan and finally David Gilbert to secure his return to the main tour. Tian returned to the main tour with a bang at the Australian Goldfields Open qualifiers as he defeated Aditya Mehta and Anthony McGill, before receiving a wildcard against Anthony Hamilton which saw him move into the last 48. There he would face Mark Davis and as in Beijing a year earlier their match would go to a decider, which this time Davis would win to qualify for the venue. 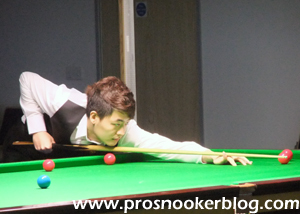 Thereafter Tian enjoyed a steady season in the PTC events, without ever being able to run deep into the events, while at the UK Championship qualifiers he again impressed with wins against Bjorn Haneveer and countryman Liu Chuang before losing out to former world finalist Nigel Bond. During the second half of the campaign Tian’s best run was to come at the Haikou World Open qualifiers as he defeated Stuart Carrington and Adrian Gunnell, before losing 5-2 to Mike Dunn. His season was to end though with a shock 10-5 defeat at the hands of Adam Wicheard, confirming that he would finish the campaign ranked outside of the top 64. Tian was however handed one of the two Chinese nominations for the main tour in 2012/13. Tian made a solid start to the 2012/13 campaign, winning his opening match in the first four full-ranking events of the season, without being able to go further in any of them. His form at the PTC events was to be similar, quarter-final runs at the APTC1 and ET2 events proving to be his strongest runs, until a semi-final run at the ET6 event in Germany. During the second half of the season his best run would come at the China Open qualifiers, where he defeated Martin O’Donnell and Peter Lines, before losing to David Gilbert. Tian’s best result of the 2013/14 season was to come at the German Masters, where he defeated Michael Wasley, Andrew Higginson and Neil Robertson to reach the last 16 stage, before losing out to veteran Rod Lawler in a deciding frame. 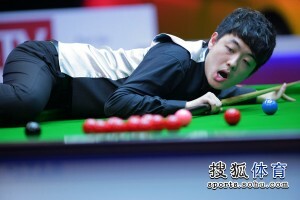 It was to prove a bitter sweet season for Tian overall however, as he rose to a career high 49th in the rankings on the points-based list, only to suffer relegation from the main tour following his defeat to Robin Hull at the World Championship qualifiers, due to the change to a prize money based ranking list on which he was only 66th. He was to earn a reprieve however, coming through the first Q School event of the season with a 4-0 victory against Eden Sharav to immediately regain his place on the circuit. Tian’s best performances during the 2014/15 season were to come at the best of seven frame events as he reached the quarter-finals of both the Haining Open and Paul Hunter Classic tournaments before the turn of the year. A further last 16 appearance followed at the Xuzhou Open, before he repeated the feat at a full-ranking event, the India Open in Mumbai, before losing to eventual runner-up Ricky Walden. 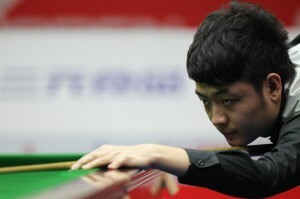 Tian’s results were enough to see him earn over £23,000 and rise to 83rd in the rankings by the end of the season.